Because actions have consequences, newly pardoned ex-sheriff Joe Arpaio is now talking about running for national office, despite the fact that he was convicted for criminal contempt of court and, before that, spent several decades abusing people on the basis of their race. Guess when you’re given a pass by the heaving spore who occupies the highest office in the land, you feel pretty bold no matter how many years you’ve spent in the courts being rightfully prosecuted for your illegal deeds. Arpaio told the Washington Examiner that “I could run for mayor, I could run for legislator, I could run for Senate” in Arizona, and in particular he’s eyeing the 2018 seat of Senator Jeff Flake, who’s also potentially facing an opponent in the vile, far-right Kelli Ward. Gallingly, the 85-year-old Arpaio also said there “is discrimination against senior citizens, big time... I’m proud to be my age. I work 14 hours a day. If anyone thinks my age is going to hold me back, I’ve got news for them.” While age discrimination is certainly a problem in issues from employment to politics, it’s rich for someone to complain about that after spending 20-some years aggressively discriminating on people based on their race. But this was always going to happen. Trump’s despicable, depressing pardon of one of the most institutionally racist people in the country—as citizens in Texas battled one of the worst storms in recent history—was just another facet to an increasingly escalating platform which endorses discrimination based on race, creed, gender, orientation and religion. If it weren’t clear a year ago, it should be crystal now: Trump would like to dismantle progressive policies dating as far back as The New Deal. As Joe Biden put it in The Atlantic on Sunday, “We are living through a battle for the soul of this nation.” And even if a provable majority of citizens are against every step away from the Constitution Trump takes, there will still be long-term effects on our democracy, be it in the legislature of the judiciary. 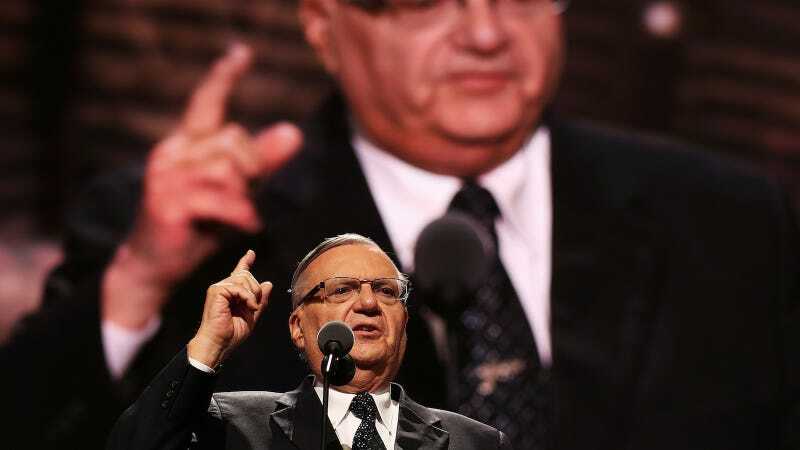 Arpaio may run, or he may be full of bluster; he may win or he may lose; but he won’t be the last of his kind.